Our 10/150, 20/150 and 30/100 RF power supplies represent an exciting new alternative for lower power precision induction heating applications. With 10, 20 or 30 kW of output power over a wide operating frequency range, these models are ideal for applications such as brazing, shrink fitting, annealing, curing and tempering. 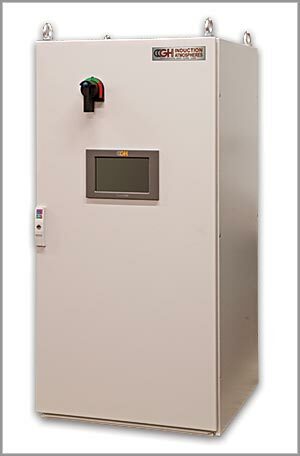 Our GH IA Model 60/30 induction heating power supply represents an exciting new alternative precision industrial heating applications that require higher power. With 60 kW of output power over a 0.5 to 30 kHz operating frequency range, the GH IA Model 60/30 is ideal for applications such as heat treating, brazing, shrink fitting, annealing, curing and tempering. GH Group offers generators ranging from 500 Hz to 450 kHz and from 2.5 kW to 2400 kW. Our Transithermic® transistor power supplies can work in variable frequencies. The frequency is automatically coupled to the load, in every application, inside a wide range.